Last year I contacted Ian and in our conversation, I asked about a new line of shaving soaps he was introducing to the wet shaving community. I was pretty excited to try the samples he wanted to send me but as I waiting for the parcel to arrive I slowly realized this was not going to happen. My excitement faded away with passing time and I completely forgot about Ian and his new company. Then last week ( 9 months later ) a package arrived and inside was a shaving soap, and Post Shave Tonic with a note explaining just what happened to the OZ Shaving Co. As it turns out Ian decided to go back to the drawing board to rework the formula and a tallow & stearic acid-base was born. This new formula is outstanding and I’m glad Ian remembered me. The packaging is great with the Wizard of Oz theme and its done extremely well. You have 8 different scents to choose from the one I will be talking about is YellowBrick. This is a 4oz shaving soap in a white plastic tub with a black screw on lid. The label pictures the yellow brick road from the movie and a meandering road. The tub has side labels as well including the ingredients and How to lather information. The scent is an intoxicating Vetiver, Cedarwood, and Bergamot. Three ingredients I’ve seen together many times before but this one is becoming my favorite by far. 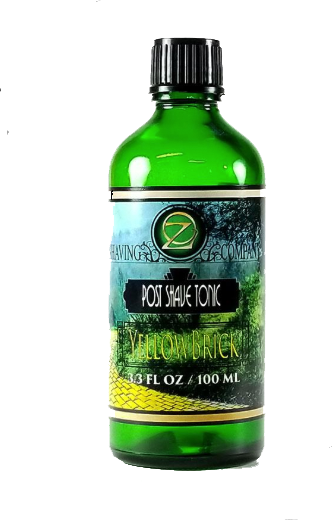 The soap scent is on the light side at first and then increases when lathering but don’t expect this to last after the shave it tends to fade fast so reach for the post-shave tonic it saved the day and you won't be disappointed. I had no problems bowl lather and created a rich creamy lather in a little over a min. I was able to get this right into the beard which provided great coverage. The slickness and glide where tops allowing me to go over trouble spots without the fear of irritation. 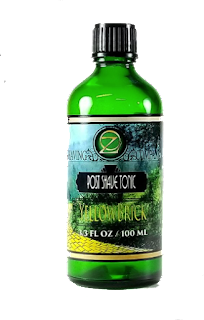 My post shave feel was fantastic and the tonic just but the icing on the cake to a great shave. To say I had a great time with YellowBrick would be an understatement. 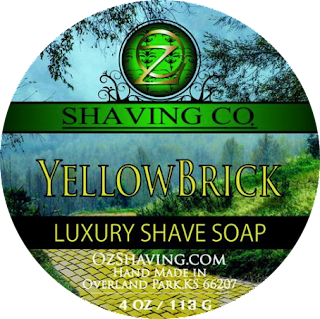 The scent was fantastic along with a great performing tallow based soap but don’t forget the post-shave tonic once you use it you’ll never buy an Oz Shaving Soap without one.